Are you planning a trip to Death Valley in California? Are you going to be visiting the Furnace Creek area? If so, we have two great lodging options to share with all of you today. If you are looking for family-friend accommodations The Ranch at Furnace Creek is perfect for you. If you are looking for adult romantic accommodations then check out the Inn at Furnace Creek. Let's break things down: First, it’s in a desert, so sun is abundant. Second, average temperatures are 73 degrees in February, 82 degrees in March, and 90 degrees in April. And third, it’s a natural oasis with ancient pristine water bubbling up from the ground, turning the area green with trees, vegetation, flowers and enough grass for a golf course (the lowest on Earth). There are two distinct experiences at Furnace Creek. 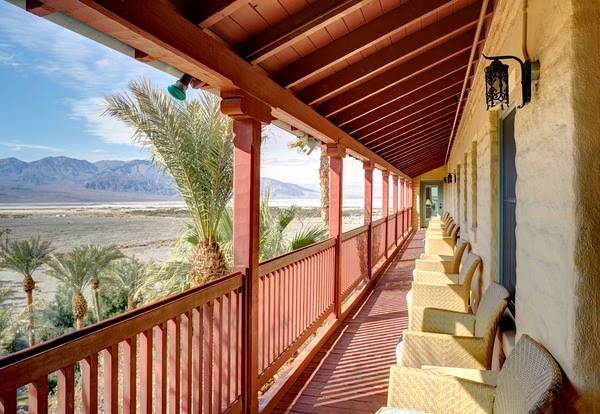 The Ranch at Furnace Creek, with its towering palm trees and true oasis atmosphere, is situated on the desert floor. Fed by spring waters, The Ranch boasts a large pool, golf course, post office, general store, casual dining restaurants, horseback riding and 224 family-friendly rooms. The Borax Museum, with artifacts large and small including some of the original 20 Mule Wagon Team trains, also calls The Ranch home, as does a nearby landing strip. The Death Valley National Park visitor center is also within walking distance. For a more sophisticated and refined experience, the romantic Inn at Furnace Creek, nestled into the mountainside where the spring bubbles forth, was built in the late 1920s by the Borax Company and features 66 elegant rooms, fine dining, verandas with sweeping views of Death Valley, opulent gardens, a stunning spring-fed pool (maintaining a constant temperature of 85 degrees), tennis courts and pool-side massages. And there is plenty to do – or not do. For active vacationers activities range from hiking, cycling, and Jeep treks to horseback riding and golf. The lush oasis also attracts wildlife such as roadrunners and coyotes, and it is also one of only eight designated Dark Sky Places in the United States where star-gazers can actually see the Milky Way with the naked eye. Spring Break Rates begin at $179 for The Ranch and $409 for The Inn and do not include taxes and resort fee. For additional information, call 760-786-2345 or visit www.furnacecreekresort.com. Furnace Creek Resort is two hours west of Las Vegas by car and a four-hour drive from Los Angeles.